and announces further growth as part of The Big 5, one of the world’s largest construction events. Hosting over 8 000 professionals from 44 countries, the 6th edition of the African Construction & Totally Concrete Expo is one to remember. Not only has the event gathered hundreds of exhibiting companies at Johannesburg’s Gallagher Convention Centre for two days of business and networking. It has also achieved its declared objective for 2018: putting the topic of transformation and empowerment at the center of the construction industry’s agenda. The show offered 45 workshops on 16 and 17 May, where experts shared insights and knowledge with hundreds of attendees. The event also hosted the first ever Transformation Corner, focused exclusively at promoting transformation and empowerment in construction. “Transformation and SMME development play an ever more critical role in building, advancing and innovating Africa’s construction industry,” said Aubrey Tshalata, National President of the National African Federation for the Building Industry (NAFBI) and one of the speakers at the event. Transformation initiatives were also in the spotlight at the event’s opening Keynote session. Here, the Executive Mayor of the City of Johannesburg, Herman Mashaba, and MEC Jacob Mamabolo from the Gauteng Department of Infrastructure Development, among others, addressed over 500 attendees. “I listened to the Mayor of Johannesburg and to the MEC of the Gauteng Department of Infrastructure Development at the Keynote session and I am now excited that as a woman-owned company we are finally going to have the right space in the industry,” said visitor Jackie Gokamilwe, Owner of Socrasync Investment. “The African Construction & Totally Concrete Expo 2018 has been a tremendous success. 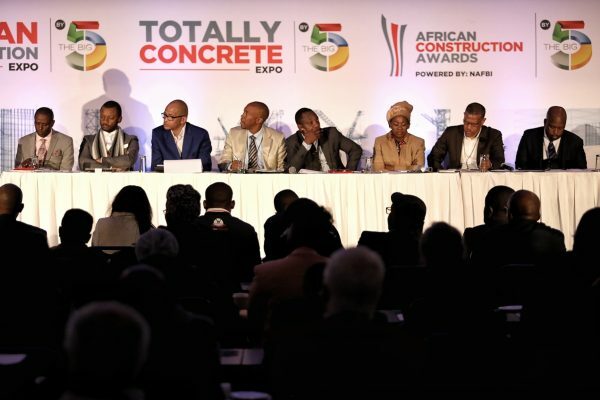 The African Construction & Totally Concrete Expo will return to the Gallagher Convention Centre in Johannesburg from 11 to 13 June 2019 as part of The Big 5. The Big 5 is the largest portfolio of construction events in the Middle East, Asia and Africa, and with this new positioning the exhibition is expected to grow its international participation significantly. “For the first time ever, the show will run for three consecutive days. The decision comes in response of a growing market demand,” announces Behr. To know more about The African Construction & Totally Concrete Expo, visit www.totallyconcrete.co.za.